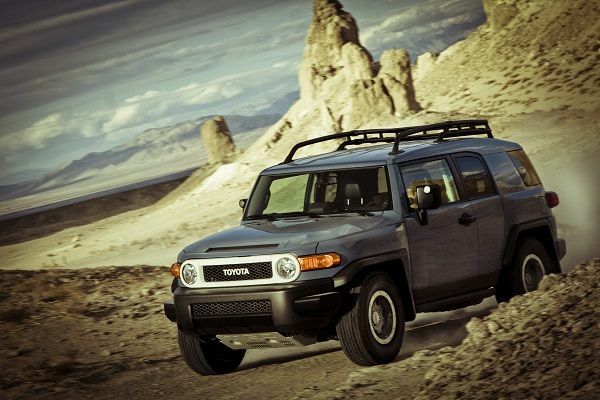 Toyota’s much-loved FJ Cruiser will soon roll off the assembly line for the last time. The FJ is loved by people in the way the Tesla Model S is loved. They love the idea of it, even if they don’t personally have the budget or the need for the vehicle themselves. Toyota always promised the FJ would be a one-generation vehicle. We know the time would come. Those who waited ‘til the last minute, however will be rewarded with a special edition. At off-road events, and even at car shows, I often run across guys (and gals surprisingly) who say to me “I wish I had bought a vintage FJ40 new and put it away…” What they are referring to is the fact that some special off-road vehicles actually increase in value, like exotic cars do. Anyone with a mud fetish and some extra greenbacks lying around might want to think about stepping into a Toyota dealership soon because it would seem clear that the FJ will be a vehicle people will look back on and wish they could still get. The FJ is a very low selling car. It sells in the same numbers as an electric car would. That is to say sales are terrible. However, the FJ was so specialized, and so over-qualified for its mission it was always destined to be a low volume vehicle for Toyota. The FJ has so much more ability than Americans will ever really need that it is like your neighbor’s Porsche. It never sees its full potential, but he likes to rub it with a diaper every Sunday and pretend he will someday drive it sideways at 180 MPH. The final hurrah for the Toyota FJ will be the “Ultimate Edition.” It will come in a special color blue with a white trim that commemorates the FJ40 from the 1960s. This final FJ will be the most trail capable one ever. Features include a Toyota Racing Development (TRD) off-road suspension with TRD Bilstein race shocks with increased damping, articulation and high speed stability, as well As TRD springs and other kit. The rear shocks even have remote damper fluid reservoirs to allow the fluid to cool and reduce damping fade. If you have ever had that problem, please tell us your story below. Roof racks that look like they could hold a safari’s worth of stuff are included as are TRD 16-inch bead lock wheels with BF Goodrich A/T KO. The vehicle looks the part. Toyota says it will “only” build 2,500 of these special edition FJs. However, a sneak peek at the sales numbers reveals that this is fully a quarter year’s-worth of FJs at the current pace, though that will likely pick as those who want one more and those who want to fulfill their dream step up at the last minute. If you have always dreamed of owning a Mercedes G-wagon, but have a more moderate budget, now is your final chance to get Toyota’s version of the Land Rover, Jeep Wrangler, And Hummer H2. Too bad....the FJ was always one of my favorite off-roaders.